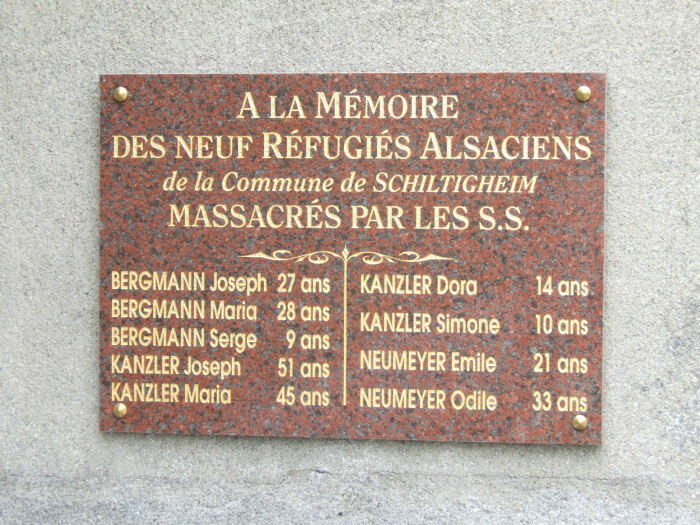 This memorial is to the 9 refugees from Schiltigheim, a suburb of Strasbourg in the province of Alsace, who died on the 10th of June 1944 in Oradour-sur-Glane. The slab is mounted to the left of the main memorial slabs carrying the list of 642 victims names. It seems to have been installed during 2007 as it was not present in early November 2006. Joseph Bergmann was the man who told Marcel Darthout, whilst they were waiting in the Laudy barn, that the Germans were going to kill them all (see Chapter 2 of In a Ruined State). See also the memorial in Schiltigheim itself and the one on the right of the main memorial in Oradour to those from Charly-Oradour. Dating from 2012 and shown to the right of this memorial is another memorial to those of the Jewish faith (seven of whom are shown as having come from Alsace). Note also the minor differences in the spelling of names and the quoted ages between the memorials at Oradour and those at Schiltigheim and at Charly-Oradour.